Here’s my new service: http://gratis.thijsbroenink.com. 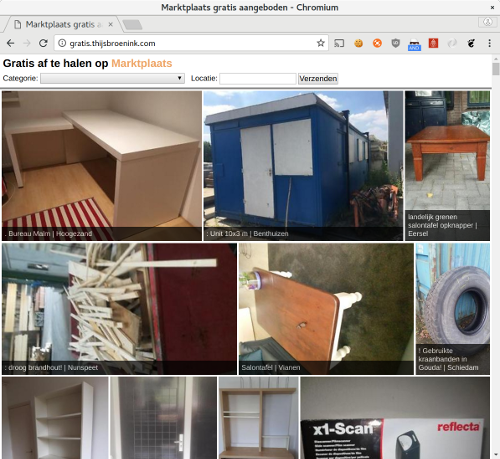 It shows all advertisements from the Dutch marketplace Marktplaats that are given price tag: FREE, sorted by newest first. So this could be useful for anyone that’s interested in for example a second-hand sofa set or just wants to see what’s been given away for free. You can sort by category or select a city to filter on. It uses the Marktplaats API to get the latest advertisements. I parse all json output and use Justified-Gallery, a jQuery addon, to create the grid. Full code is available on GitHub. I’ve released http://kijkcijfers.thijsbroenink.com, a service where Dutch people can view how popular a TV show is. It gives a graph of the latest ratings, coming from Stichting Kijkonderzoek. If you like this tool, please share it so more people know it exists! A issue with Google: for some reason Google indexes the page before the Angular library has been loaded, so their database doesn’t match with what’s visible (example). If anyone finds a solution for that, please comment below. Thanks! 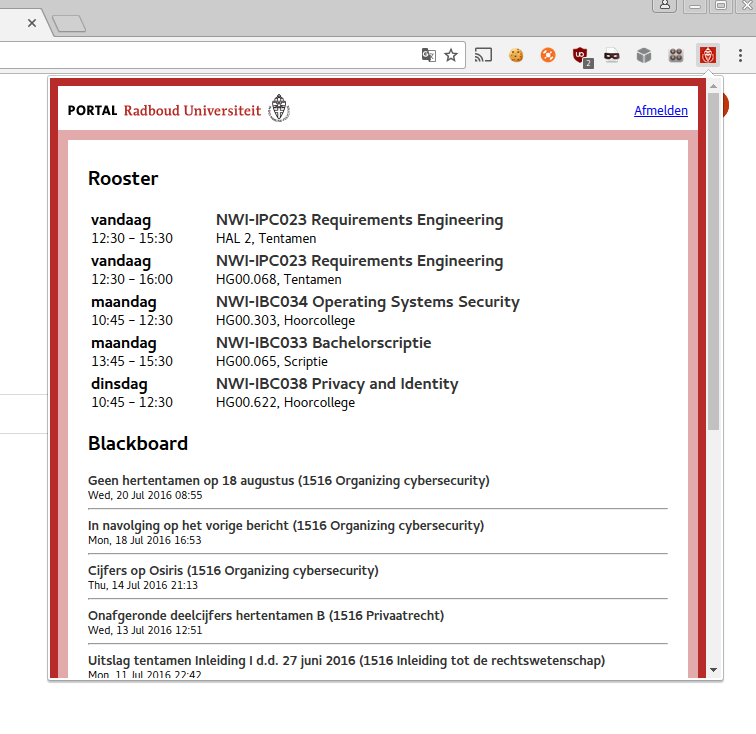 I have released the first version of my Chrome extension for Radboud University Students. With it, students are able see their schedule for the next days, their latest Blackboard notifications and their incoming email. Download the latest version in the Chrome Web store. I own a Xiaomi Mi4 and I discovered it comes with a pre-installed app called AnalyticsCore, package name com.miui.analytics, that’s running in the background. I’m not a big fan of apps gaining information without my permissions, so I started investigating its activities. For those who don’t know, Xiaomi is the largest smartphone manufacturer in China and actively growing worldwide. For this I downloaded dex2jar and Java Decompiler and started AnalyticsCore.apk in it. The APK is downloadable here if you want to take a look yourself. I first googled what its purpose is, and I found a single thread on the Xiaomi forums, but there is no response or explanation on what it does. See this thread. As you can see, it makes a request to http://sdkconfig.ad.xiaomi.com/api/checkupdate/lastusefulversion? which is of course an official Xiaomi domain. It sends some parameters with it: including IMEI, MAC address, Model, Nonce, Package name and signature. Now the question is, where does this APK gets installed? I couldn’t find any proof inside the Analytics app itself, so I’m guessing that a higher privileged Xiaomi app runs the installation in the background. The question is then: does it verify the correctness of the APK, and does it make sure that it is in fact an Analytics app? If it does not, that means Xiaomi can install any app on your device it wants, as long as it’s named Analytics.apk. It seems like there indeed is no validation on what APK is getting installed. So it looks like Xiaomi can replace any (signed?) package they want silently on your device within 24 hours. And I’m not sure when this AppInstaller gets called, but I wonder if it’s possible to place your own Analytics.apk inside the correct dir, and wait for it to get installed (edit: getExternalCacheDir() is inside the app’s sandbox, so probably not). But this sounds like a vulnerability to me anyhow, since they have your IMEI and Device Model, they can install any apk for your device specifically. If you own a Xiaomi device yourself, you might want to block all access to Xiaomi related domains, because by far this isn’t the only request to a Xiaomi site. I use AdAway for this. It does require root access, but that should be no problem if you run the International ROM. I don’t know if the official rom supports root access out of the box. If anyone has tips or a comment, please email or contact me. For anyone that’s running Arch Linux and wants to emulate a file system different than their own architecture, here’s a small tutorial how to do that. In my case I had a file system from a Raspberry Pi (armv6), and I wanted to run it on my laptop with x86-64. This stackoverflow question did help a lot, but it didn’t work 100% for me, so hopefully this tutorial will help anyone (it’s also reminder for myself). For the emulation I use QEMU. Best is to run all commands as root. First, download qemu-user-static from the AUR: https://aur.archlinux.org/packages/qemu-user-static/ and also binfmt-support: https://aur.archlinux.org/packages/binfmt-support/. I installed it using Yaourt, but there are many ways to install packages from the AUR. It runs an emulated shell (bin/bash is on the filesystem). From there you can do whatever you want: all files and commands will run through qemu. This is also very useful when downloading firmware online, for example a router’s firmware. You can easily emulate it with qems and chroot into it. That’s very interesting in some cases, for example to find security issues or to make a small modification before flashing it. For those who are running Windows 7 and (just like me) don’t want to upgrade to Windows 10, here’s a script to remove all Microsoft updates contributing to the upgrade. It fetches the documentation for all installed updates (not security related and starting from 2015) and looks for certain keywords inside that documentation. Currently it removes everything mentioning “Windows 10”, “ease the upgrade experience”, “upgrading” or “telemetry”. You can change this to your own words inside the script. Note, this should also remove KB3035583 that gives the Windows 10 upgrade icon in the taskbar. That tray icon should be gone after running the script. It also tries to remove all telemetry features which collects all sorts of user activity and sends it to Microsoft. It is enabled in Windows 10 by default and Microsoft hasn’t provided an option to completely disable it for Home and Pro users. Some telemetry updates are installed in Windows 7 as well, for example KB3068708. The script is written in Python2. If you don’t have it, install the latest version here: https://www.python.org/downloads/. I have only tried it on Windows 7 x86, but it probably works on 8(.1) and 64-bit as well. print "Getting installed updates list..."
print "Fetching KB documentations (this might take a while)..."
print "Ready to remove following updates:"
print "They will be uninstalled one by one. You can choose individually whether you want it removed or not."